With it’s brightly colored wooden buildings and huge billboard signs it’s hard to miss Mimosa Pattaya the self proclaimed “City of Love”. Located 10 km south of Pattaya along Sukhumvit highway, the latest addition to the Pattaya shopping scene is so much more than just shops. Billed as family experience they have cleverly incorporated many other attractions into what is otherwise just another out of town mall. Not only will visitors find shops here, they will also have the opportunity to experience a cultural show, Ladyboy show, petting zoo and children’s zone. Making it truly somewhere the whole family can enjoy. It is yet to be determined if Mimosa Pattaya will be a success or not. But since opening in 2013 it has become quite popular with locals, but this may be just a novelty factor. Bus loads of Asian tourist are brought in everyday by their tour companies. Designed to bring a little bit of European chic to Pattaya, Mimosa has been designed to resemble the French city of Colmar. 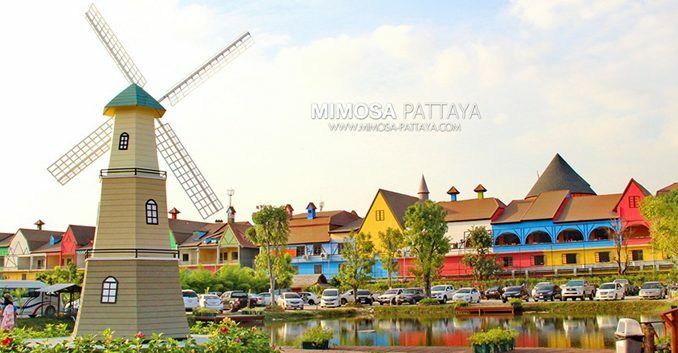 It is certainly unlike any other shopping mall in Pattaya, whether it resembles Colmar only someone who has been to both can decide, certainly not us. Despite it’s colorful french architecture and picturesque scenes the shopping here is rather generic. The goods on offer are the same arts, crafts, souvenirs and clothing items found across Pattaya. If that is what you after you are much better using one of Pattaya’s markets. However if you are looking for somewhere to entertain the children and the husband whilst you indulge yourself then this is when Mimosa wins. They will certainly enjoy the shows on offer. As well as the petting zoo and children’s zone at the back. I suppose this makes Mimosa sound more like an attraction than a shopping mall? Well the entrance fee may also make it feel that way. At the time of writing the mall is charging 600thb ($17.50US) per foreigner to enter. Most of us will not be used to paying to enter shopping malls, but here they are really trying to market this as an attraction as well. If you take in the shows then the fee isn’t too steep. There are plenty of food and refreshments on offer once inside. Such as Thai, Russian, Chinese and European offerings. All of which seem to be of a reasonable price and good standard. Located 10 km from the center of Pattaya means unless you drive the only viable option would be either taxi or organised tour. The white sukhumvit baht bus does run out this far, but it is a fair way down a highway to be hanging off the back of a pickup truck. Overall in our opinion Mimosa Pattaya is trying to be too many things all at the same time. Not really a shopping mall and not really a fully fledged attraction. It is somewhat lacking in either. Better shopping can be found elsewhere in Pattaya, and there are certainly better cultural shows. As for the ladyboy show, it is merely a taste of the real thing, which we highly recommend such as Tiffany’s. Having said that if you are looking for something to keep the whole group entertained than it’s versatility works.